Faraday’s Law of Electromagnetic Induction states that whenever there is a change in the flux linking through a coil, an emf is developed in the coil. Thus for production of emf, flux linking through the coil must change but for the flow of current through the coil, the circuit must be complete i.e. coil should not be open for the flow of current. For better understanding of Electromagnetic Theory one must read “Principle of Electromagnetics by Matthew N.O. Sadiku.” This book is just awesome and I guarantee that if one has gone through this book, his concept of Electromagnetics will be crystal clear. Working Principle of Transformer is based on Faraday’s Law. Let us assume a Core Type Transformer as shown in figure below. As shown in the figure, Primary winding of the Transformer is supplied with an alternating voltage source V1 while keeping the Secondary open. Due applied voltage V1, an alternating current Ie starts flowing through N1primary turns. Because of this alternating mmf, an alternating flux is set up in the core of Transformer which links with the Primary as well as Secondary winding and as per Faraday’s Law of Electromagnetic Induction, an emf E1 & E2 are developed across the terminals of the Primary and Secondary winding. This phenomenon is popularly known as Transformer action. All the flux set up in the core links with the Secondary winding i.e. 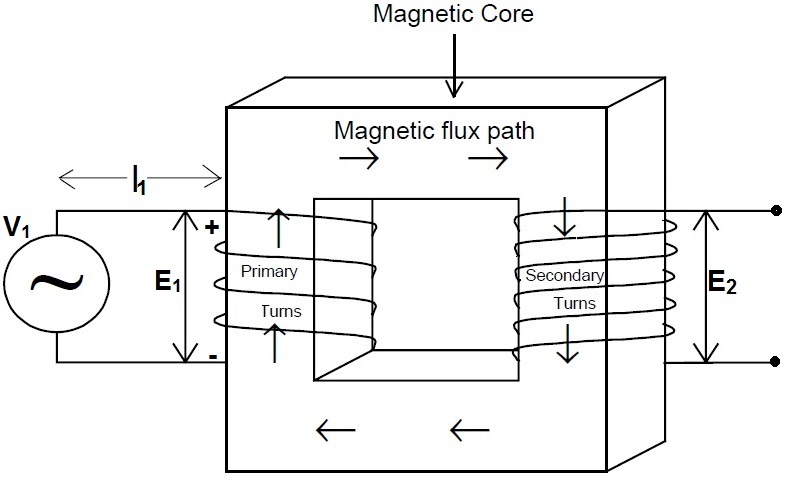 the flux is confined in the magnetic core of the Transformer. The core losses are negligible. Magnetization curve of core is linear. Let the voltage V1 applied to the Primary of Transformer be sinusoidal. Thus the current Ie will also be sinusoidal and hence the primary mmf N1Ie must also be sinusoidal in nature. Note that flux Ø set up in the core of Transformer will be sinusoidal as the Primary mmf responsible for setting up the flux is sinusoidal. Where Øm is the maximum value of magnetic flux in Weber (Wb) and ω = 2πf is the angular frequency in rad/sec. Thus we see that the emf e1induced in the Primary winding is sinusoidal and lagging behind the flux Ø by 90°. Similarly, as the flux in the Transformer core is Ø, this flux will also link with the Secondary to induce an emf in the Secondary winding. Emf per turn in Primary = emf per turn in Secondary. As soon as switch S is closed, a current I2 starts flowing in the Secondary winding. The direction of this current will be in such a way to produce a magnetic flux opposite to the direction of working flux set up in the core. (This is as per the Lenze’s Law which says “Effect Opposes the Cause”). Thus the direction of current in the Secondary winding will be in anticlockwise direction; this is because current in anticlockwise direction will produce flux in upward direction in the core. V1 = E1and V1 is constant. This simply implies that working flux in the core of Transformer must be constant. To have a constant flux, Primary must draw an additional current I1’ from the source to compensate for the reduction caused by Secondary current. 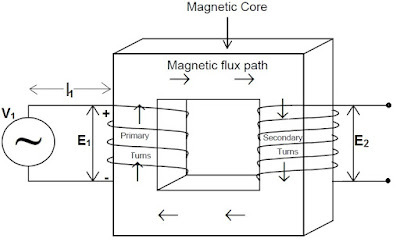 Any change in the Secondary current is at once reflected by a corresponding automatic change in the Primary current so that core flux remains constant. Here I1’ is called load component of current. Ie is called the Magnetizing current as this much of current is required to set up working flux in the core when the Secondary terminal is open. Note that, concept of Transformer action is very important and one should know hoe to use and implement this concept. «How to Find RMS Value of any Function?